The Ak-Chin Industrial Park Board was established by the Ak-Chin Community Council to develop, operate and manage the Community’s industrial properties. It is responsible for the marketing, development and management of Santa Cruz Commerce Center, the property surrounding the Ak-Chin Regional Airport, and an interstitial property known as the Bunger Property, which includes the Adobe Office Suites. 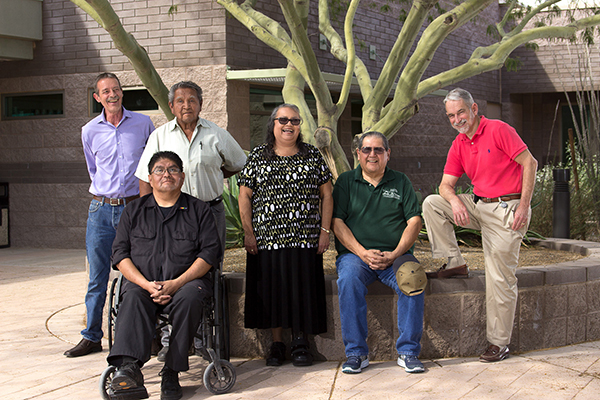 The Board is comprised of five members, which include three lifelong Ak-Chin Indian Community members – Chairman Charles Carlyle, Vice Chair Maria Hernandez and Board Member Franklin Sam – Terry Enos, a former member of the Salt River Pima Maricopa Indian Community who became an Ak-Chin member in 1961 and served in various Ak-Chin government positions, including Community Council Chairman; and Leonard Gold, a former consultant for Ak-Chin Energy Services, also serve on the Board. The Board’s Property Manager is Phil Entz. The Board is committed to economic development in the area and acts as a tenant advocate both within and outside the Community to identify opportunities, streamline processes, and accelerate solutions to any issues that might arise.